This script works on SharePoint 2013, 2016 and Online. I heard it works on 2010 as well, though I haven’t had much experience with it there. Let me know! The script is here: download from GitHub. Include the script along with jQuery on your page. Ideally, throw this nugget into your master page and you can use it anywhere in your site. See the difference? It’s subtle, but when working with end users, it can provide a huge benefit to help streamlining your business flow. From here, you could have the edit form disable or hide a lot of the fields for normal users, only allowing your Project Managers, or if this is a support request list, your Support Team access to modify fields as needed. The options are endless. Simply disables the field, for all users. It hides all controls in the field and displays the value instead. Disables the field, but enables it for the users in the groups specified. Also, Site Collection Administrators are included automatically, so they can always edit the field. You can send the groups in an array, like [“Group One”, “Group Two”]. Simply hides the field, for all users. Hides the field, but shows it for the users in the groups specified. Also, Site Collection Administrators are included automatically, so they can always edit the field. You can send the groups in an array, like [“Group One”, “Group Two”]. Currently, this script does not work on list views, meaning a user could edit the data in datasheet/quick edit view. This script should work just as well on SharePoint 2010 if you so desire. Download this script here: download from GitHub. Til next time, Happy SharePointing! 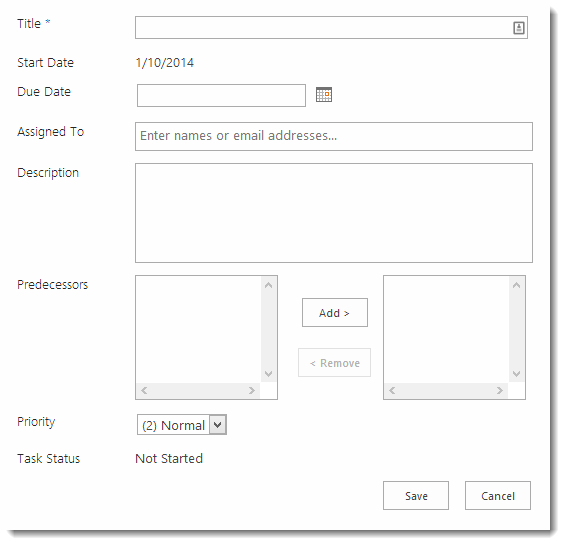 Adding a lookup field to your SharePoint solution: declaratively or programmatically? Love the script, really useful. Having a small problem though. I am using o365 and when I try to disable a ‘Multi Line Text’ field it, disables it and then just shows text, but then directly below it shows the text box. Hi David have you manage to get around that as i am getting the same as Gary? Hi, I am new to SP. We are running hosted Office 365. I saved the .js file in Site Assets and put the script into my page but it’s not making any difference. It didn’t work for me but that may be because I am a Site Collection Admin but I’ve also checked with a user who is a normal user. I’ve tried DisableWithAllowance and Disable. Any ideas? Did you add jQuery to your page as well? Are you getting an script errors, see https://davidlozzi.com/2013/05/15/a-non-developers-intro-to-the-developer-toolbar-scripting/ for help there. Update: In addition to this not working, it removed the links at the top of the page for editing that page – the tabs for “Items” and “List”. Did you see my previous reply? Do you have jQuery? Are you seeing any script errors? Those tabs sound like tabs for a list view, and this script should be on a form for a list item, so those tabs shouldn’t exist at all. I. I followed your instructions and it seems that I have Jquery installed. I am getting erros though – SCRIPT 70: Permission Denied. I will email you a screen shot. With the help of development tools of my browser i see that my page ‘views’ your library but it never runs the above script code. When though i run on debug console the whole script or just the command Lozzi.Fields.hide(“MyField”);… it works! Can you understand which is the problem? Hi David, disableWithAllowance and hideWithAllowance doesnt work for me. i set up a group called developers on my site and have this code Lozzi.Fields.disableWithAllowance(“Assigned To”, [“Developers”]); however the field is disabled for everyone including me and i am in the developer group. any idea what im doing wrong? That looks right, so I’m wondering if there’s an error in the script. Can you run your developer toolbar, see https://davidlozzi.com/2013/05/15/a-non-developers-intro-to-the-developer-toolbar-scripting/, and see if any errors are occurring? I’m not sure this is the right code, I see more SharePoint code than my utils in here. Can you email me the code at david.lozzi at slalom.com? Thanks! Hi, I have been having the exact same issue that sonia had with the disableWithAllowance function, the field is disabled for everyone include site collection admins. I tried adding extra alerts into the code and they are not being triggered in either the getGroupsAndEnable or asyncFailed functions, that makes me think it is something to do with the spContext not being set. If you have any ideas if would be great, this code looks very useful. Can you confirm jQuery is loading properly? We were having an issue with that for a little bit. Try this new script if you will, https://lozzisp2013.codeplex.com/releases/view/127625, I removed the condition for site collection administrators. Hi Sonia, how are you? I’m having the same problem as you wirh disablewithallowance. Can you tell me, how did you solve this problem? Hi Leticia, I’ll be working on an update this morning and sending it out to you shortly. Thanks! Hi David, just one question, how can I hide some lists using powershell scripts? I have downloaded your script. But doesnot work with the lookup column. It hides the label but the drop down is still visible. Any idea on this one? How to hide the lookup column. Can you provide the line of code you’re using? What version of IE are you running under? I think I found something that might cause an issue. I have downloaded and used your script from codeplex. Its great and it works perfectly ok for the simple “hide” and “disable” commands but fails when i try to use the “disableWithAllowance” and “hideWithAllowance”. I’ve performed the following steps with no luck. 1. Created a simple named SP group called “DummyTEST” and added the test account to it. 3. The “disableWithAllowance” and “hideWithAllowance” doesn’t work and it either disables or hides for everyone. Problem is similar to what was described by Sonia last month. I’m using “jquery-1.11.1.min.js” version of the jQuery file. I’ve also checked the error logs using the browser developer tools and it only throws warning message related to some body tags. Nothing that I could see related to this code. Any idea if i’m doing wrong? A couple of others have reported issues with the Allowance functions. I’ve retested and unfortunately continues to work fine here. If you’d like, we can connect remotely and I can see it in action on your computer. Email me, david.lozzi at slalom.com and we can coordinate. Great post and perfect solution for my need but Weirdly it doesn’t work for me. SP 2013 Onpremise. Included the Jquery locan and Lozzi JS along with the small code in CEWP on all three forms but it doesnt work. Not even hiding or disabling. Any idea of the mistake i’m doing? I can send you the code if you wanna have a look. Are you getting any errors in the dev toolbar, see https://davidlozzi.com/2013/05/15/a-non-developers-intro-to-the-developer-toolbar-scripting/. If not, send me your scripts, and the HTML output from the page (right click and select View Source). were you able to see if any errors were occurring, using my previously posted link? So, this sounds really interesting but I’m new to this level of customization and don’t really know where to put this on the page. I can’t stick it in the middle of the XSL in SPD (tried that) so I added a script editor web part on the new editform.aspx page and downloaded the .js file to the root site (also copied the js URL and pasted that into the snippet). Any other helpful links or tips to get me going? Thanks! You’ll also need to include a reference to jQuery, can confirm that’s there? Try without the disableWithAllowance, others have been reporting that’s causing issues, but I can’t seem to get a legit error from it. Still no joy, but I think I’m missing something fundamental that is shorthand for the pros. I went to my new form (progressEditForm.aspx) in SPD13, added a web part, and then went to the form in IE and edited the page. Created the script editor, added the snippets, tweaked the fields and URL, downloaded the js file from codeplex, uploaded it to root collection site assets, pasted the js URL into the snippet, verified jquery 1.9.1 is running in our environment. Am I missing anything? Any ideas on what might cause this? If I could get this working om my Office 365 Site, that would be great! The undefined error has been solved(see code below), but now I’m facing the problem that the disableWithAllowance and hideWithAllowance are not working. There are no erros visible when debugging. Anyone who got these two working in Office 365? the normal hide and disable funtion works fine. David, I am also trying out this script and I am having problems with the disableWithAllowance and hideWithAllowance functions. Grate, very good job Lozzi!! wish you all the best. This is awesome. Thanks, David. I am going to especially like the the disable feature. worked like a charm. Thanks again for the wonder script! nice one, I have an issue in office 365 sharepoint online people picker, It is not displaying just user name, It is displaying all details as shown blow. any way we can display only name in office 365? I have also got the same issue that Lozzi.Fields.disableWithAllowance is not working properly. The field gets disabled for everyone. I noticed that few users had the same issue and they have found the solution; I would request those users to write details that how it had resolved. I tried the script and it’s working fine. But Lozzi.Fields.disableWithAllowance(fieldname, groups) is not working for “People Picker” and “Date” field. Can you pl look into it. I am having issues with People Picker and the drop down fields as well. But the link you provided doesn’t seem to exist. Would you be able to send? I know I am late to the party. Will appreciate the help. BTW, I was able to fix the PeoplePicker issue. I had to go to the Loozi.js and change ms-inputBox to ms-inputuserfield. That did the trick. Now if only drop down field can be fixed. Ah! Thanks for the comments. I’m not sure what the issue is exactly :P. I just updated the script for a fix for People Picker and Metadata fields. Can you try this most recent version, also noting the update above to my sample script which includes waiting for sp.js. I would like to know is this script works fine for any jquery version, or do I have to download the exactly same version that you are using? Hi David. Thanks for your information. This solution works for SharePoint cloud? Using Office 365? Yes! I do most of my dev on Office 365, it will definitely work. I have another doubt… I already add the Jquery to Seattle master page… is this correct? And which section of my script do I have to insert the lozzy script? Sorry… I am new in this cenario… before I used to work with WebServices in Infopath.. to disable field… which is very simple.. But as another users said, I am also having problems witht Lozzi.Fields.disableWithAllowance is not working properly. The field gets disabled for everyone. Do you have any idea ou new update for this? Obs: I’v already downloaded the new version of script (Lozzi Field No Site Col), and stil got the same issue… I’m site collection admin, and the field still disable for me. David, can you help me on this? Hi David.. it’s working now… thanks so much for your help. Excellent! Thanks for the feedback! How did you get that error to leave? I’m trying to disable the choice field(radio button) but it’s not working properly. it will disable the field but will add extra text of “ctl100” before the Options. Please tell me how to deal with this. Can you give this version a try? https://www.sugarsync.com/pf/D6239992_94044224_615837. I believe this should do it. I was seeing it not work, but I wasn’t seeing a ctl100. If you continue to have an issue, email me a screen shot, david.lozzi at slalom.com. Thanks! Which link? the CodePlex link? It’s working for me here. I’ll email you the file shortly. I have your most recent code and am using it in a New Item page on office 365 version of sharepoint. But inspite of me being a site collection admin, still the people pickers are disabled for me on the form. Could you please help me on this. I dowloaded the last version of Codeplex and also the last version of jQuery. I am using SharePont 2013. The hide and disable arre working properly, however the disableWithAllowance is disabeling for everybody. Can you help please? I have a checkbox. Once it is checked, it should be disabled in editform. Is this easy to do? Can you help me with sample code? Hello David, Thank you for an awesome script and the continued support with it. I have an issue that nobody has submitted yet. I’m using the script to hide with allowance for 8 columns. I’ve added it to the View, Edit, and New item pages. In IE, it works perfectly for all 3 pages. In Chrome and Firefox, it works for Edit and New, but only hides the first column (in the script) on the View pages. Any ideas? Update: Using the console, I’m seeing the error, “TypeError: SP.ClientContext is undefined” Line 118 of Lozzi.Fields.Js. That ONLY happens on the View Item page. I’ll keep digging and let you know if I can get past it. Thanks for the great script as with an O365 environment I was unable to modify the field behavior without using VS code. I did face some issues with integrating the script into my code. ISSUE 1: disableWithAllowance() and hideWithAllowance() were not working as expected. Some troubleshooting helped me determine that it was occurring due to SP.js not loading as expected. Comments here later validated my issue and it is now RESOLVED. Many thanks. ISSUE 2: A wait image is shown on the person or group field after disabling it using disableWithAllowance(). It works fine with using just disable(). I can’t attach a screenshot here but will try and find your email and send them to you. Could you please let me know how could you make disableWithAllowance() and hideWithAllowance() work on people picker fields. The script is disabling for everybody even if you are a site collection admin. let me know if you can shed some light on this issue. Thanks for the feedback. For ISSUE 1 I updated my sample code to wait for sp.js, is this the same method you used? For ISSUE 2, updated the code. Please grab latest and let me know! Hi David: I was also able to reproduce the issue on an Office 365 environment (no customization/stock team site, master page, etc. AFAIK) re: disable and hide WithAllowance. Thanks again in advance for your help. Thanks for the comments. I updated the example script above, including a wait for the sp.js file. Shame on me :). Please try again with this change and let me know. I also updated the Lozzi.Fields script to fix People Picker and Metadata fields, grab the latest if you can! I’m trying out SharePoint and needed to use your script. 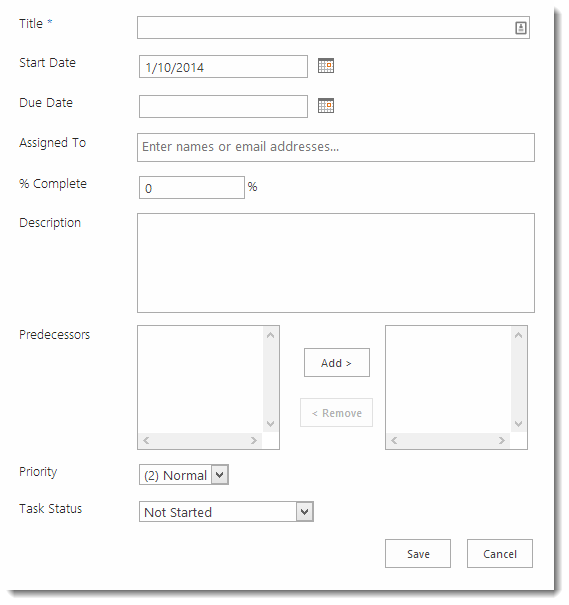 I was able to make it work on a sample list on O365. After editing the form using InfoPath, the script no longer apply to the fields. I even tried inserting the script in the “newifs.aspx” & “editifs.aspx” but doesn’t do anything. I tried running Lozzi.Fields.disableWithAllowance(“Status”, [“Group1”]); using Console and it returned Undefined. Any idea on how to enable the script in an InfoPath modified form? I was trying out SharePoint 2013 and needed to use your script. I was able to use your script on a sample list. After editing the form using InfoPath in changing the layout of the fields, the script no longer apply to the fields. I tried inserting your script in the “newifs.aspx” & “editifs.aspx” but it still doesn’t work. I used the Console to execute the script but it returned “Undefined”. Any idea on applying the script on a list modified in InfoPath? I see functions for show and enable, but I get a “not supported” when I try to call these. Are the function available? I would like to conditionally enable/disable fields based on form field selections. Can you confirm the script, including jQuery, is added to your page? Thanks for the reply. Yes the libraries are referenced and the disable() and hide() methods function as expected. But I cannot get show() and enable() working. I am referencing jquery-2.1.4.min.js and using this in a SP2013 EditForm.aspx. Any suggestions? Thanks David, I’ll try that. I am surprised no one ever had a need to show or enable a field after hiding it. Seems simple enough. thank you! I dowloaded the last version of Codeplex and also the last version of jQuery. I am using SharePont 2013. The disableWithAllowance option is working properly for the first column and rest of the column which i applied is not working on the same form, Can you help please? Can you email me the block of code you’re using and I can take a look, email to david.lozzi at slalom.com. Thanks! I just stumbled across your plug-in. Thanks for the script. I am having problems with the disableWithAllowance setting. I am a site collection admin and part of the specified group and still cannot access the field. I have verified that Jquery is loading. For the others that were having similar issues, what was the fix? Any errors in the dev toolbar? What does you calls to the functions look like? Specifically the Lozzi.fields…. no errors on the dev toolbar…. First of all thanks a lot for your awesome work you put into the community. Im having the same problem as few others, where Lozzi.Fields.disableWithAllowance does not work and disables the field for everyone. A beacon of hope or an element which could shed a bit of light into this mistery is that Lozzi.Fields.hideWithAllowance works as expected. Thank you for developing such a great tool. I’ve noticed one slight issue. When disabling a lookup field (drop down) the text is replaced by the lookup ID rather than the text. Is there any easy fix for this? I just came across this issue as well. I’ll be pushing an update this week. Sorry for the delay, latest version now supports lookup fields. Hi Dave, Thanks for a great tool. Also have a issue with disabling a lookup field (drop down) cause of thext is replacing by the lookup ID. Can you provide us an update recording to this issue? Just updated, should be all set now with lookup fields. Thank you for the great tool it was very useful to me. I read that some ppl got “undefined context” error as well as me, just surround the code with “ExecuteOrDelayUntilScriptLoaded” function and the issue will be gone. I also did many tests and found that allowance is not working against “System” account! but work with any other account even it has the same permissions on the site/list. System Account is something special, and you really shouldn’t be using it day to day. I suggest stop using an account that logs in as such. Just released update to support choice fields as radio buttons. download and let me know! Thank you for your amazing work with your lozzi.fields. I experienced a little issue when disabling a Date/Time field. I use a Date/Time field with Date and Time. If I disable this field, it only shows the date but not the time. The script is running. There are no errors in the console. I am using SharePoint 365. The title field still shows up. I am using Chrome as my browser. Am I missing something? Like Patrick, I wonder how to be able to still see the time when disabling the date/time field. can anyone tell me whats sp.js? I am having an error with the disableLookupField. Disable works for all my other fields, but as soon as I add the disable to a field with a drop down list, it stops working for all of them. 1) The lookup field is now disabled, but it only shows the ID, not the line of text. Enter users separated with semicolons. Are you able to assist with this? As an aside, is there a way that I could incorporate the colour change into this script instead of creating a new edit form? The columns I have are Task status (drop down list) and Comments (multiple line text field) I’d like on the form itself that the words “Task Status” and “Comments” be displayed in red. Hello. Tried this, but /SiteAssets/Lozzi.Fields.js is “Not Found”. Has this changed or is this now defunct? Thanks. That would depend on where you uploaded the file to your SharePoint site. Thank you for this tool. I am disabling a lookup field and while the field is being disabled, it is displaying the ID and not the Title field of the lookup. Is it possible to display the Title field and not the ID? Ah, interesting, I’ll take a look. Hi bob – I wasn’t able to recreate the issue. The code as is appears to work. Can you email me at david.lozzi at slalom.com and we can troubleshoot further? You did an awesome Job putting this together! I stumbled over one thing though: When i downloaded the latest version of your library i recognized that the return value ‘show’ was missing. Is this on purpose, since unhiding fields would be impossible that way. Which function are you looking at specifically? Whoa good catch, I’ll update! Great script! Thanks for sharing. I think this works on Display forms too, to be honest I forget. Are you getting any errors? Can I know if .setDefaultValue can be used? How do I used it? Unfortunately it looks like I didn’t finish that. It may work for a choice column as a dropdown, otherwise nothing else. Hi David, DisableWithAllowance and HideWithAllowance is not working for me. I set up a group called test members. The code should show the permission field for users in the test members group. Instead it hides the field from everyone. My immediate guess is the group name might be case sensitive. Give that a try. Also, in the dev toolbar (press F12 to open) are there any errors? Thank you for the immediate reply. The group name is case sensitive. Fixed the case and it works. Just wanted to confirm a constraint to make sure it’s not a user error on my part. When using the allowance option, am I correct in that it can’t recognize AD groups within a SharePoint group? Tried and it only seems to work when each person is added directly to the SharePoint group. Nice catch, haven’t seen that tried yet but that makes sense. I think SPs APIs in use don’t traverse into AD groups. Thanks a lot for this ! I’ve been searching high and low for ages now to find a solution to hide form fields, tried your one and it worked first time ! I just had one question, do you know if it would be possible to hide certain fields depending on the value of another through the use of your script ? I have a work type column with different choices and would like to hide certain fields depending on what work type was selected. Any ideas if I could achieve this with your script ? Managed it with the help of jQuery and your script! Can i get arround of this? I understand that he is showing me the Ids of the selections of combobox but i need the value in people picker it appear to show the id+value but i not understand the rest.. Thanks for the info back. I’ll take a look at the code in the next few days. Sorry for the delay, but I finally got around to looking into this. I can’t seem to recreate your issues on my end. If you’d like, email me, david.lozzi at slalom.com and we can continue to look further. What i think it would be great feature is if you could make some fields visible or hidden for everyone except item creator (person in “created by” field). Again, thank you very much for sharing this wonderful script. Great idea! I’ll check it out. Hi Davide, congratulation for your script, and many thanks for sharing. I have a question for you regarding multiple choice checkbox. If I disable it for modification I cannot understand which option are selected. Download the latest version and give it a try! Should work as expected now. Hi, thanks a lot for your quick answer! Seems not working now, here the console log. if I restore previous version is ok.
Can you confirm what page you’re putting the script on? I see Modifica.aspx, is that the edit screen? Yes, it’s the edit screen. Hmmm… I see you’re using jQuery 3.31, so I updated my version accordingly and it still works as expected. What version of SP are you running on? Can you Inspect your field in dev toolbar (right click on the field and select inspect) and expand the HTML out and send me a screen shot of the field? Email me at david.lozzi at slalom.com. It looks like your SP might be missing some expected content. Ah, it’s prbably a language issue, I’m looking for a comment with the workds FieldName in it, which it looks like your SP wouldn’t have. So, I’ve applied a fix, give the latest a try. Wonderful! the last version solved the problem! many thanks and congratulation for your great job! Excellent, thanks for working with me on it! Cheers! what do you think of a function to color the line? it might be useful to separate the sections of the form. Sorry, I mean color a row, like hide or disable.